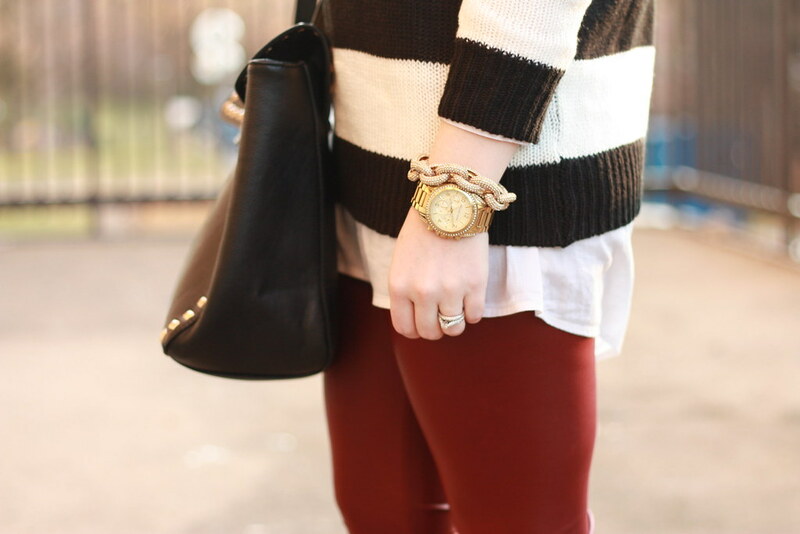 AllyCog: The best faux leather leggings. Ever. The best faux leather leggings. Ever. Is it possible to fall in love with a pair of leggings? If so, I'm pretty sure it happened the moment I put these on. Not only are they faux leather - which I have a not-so-secret obsession with - but their oxblood hue is one of my absolute favorite colors to have seized the trend spotlight this fall and winter. And we all know I live in my black liquid leggings. So much so that I've started forcing myself to wear other pants. Fortunately, these are technically other pants - which is convenient because I don't foresee myself taking them off anytime soon. It's that serious, you guys. Now stop reading this and go order yourself a pair. I promise, you will not regret it. Unless of course you don't want your legs to look amazingly lean, thin and tall. Then, of course, you might. In which case I'm just confused. Well mine are rolled up a little bit because I'm short haha :) So I think you might be okay! They're so comfy! ordering.those.leggings.NOW. thanks for the share and find lady!! Wow, those are AMAZING on you. Fully need to consider those! I have a pair of oxblood pants but these are so much better. Looking to recreate this. Pin! Very cute! I recently just got bitten with the faux leather leggings trend. Bought my first pair from eBay. Now, I'm searching for other pairs in different colors. I really like these leggings ... and the color. Great outfit. How did the sizing run? Can't decide between small or medium. i have the same ones and love them! both in black and burgundy! I love the look of these, but I'm needing a matte black pair and saw they offered a few different styles. Any advice, or by chance did you try on their black leggings.